Houghton Mifflin Harcourt, 9780470947616, 176pp. Every cookie makes a difference! In December 2007, Gretchen Holt-Witt set the lofty goal of baking and selling 96,000 cookies during the holidays, all in the name of funding research for pediatric cancer, the #1 disease killer of kids in the United States and the disease her young son was battling. Armed with the determination of a mom on a mission plus the knowledge that funds for research mean more treatment options, better survival rates, and hope for the future, Holt-Witt succeeded in selling all 96,000 cookies and raising over $400,000 for new pediatric cancer treatments. Long after the ovens cooled, requests for more cookies along with offers to help poured in. Gretchen knew she was onto something. She and her husband Larry answered the call to action by starting Cookies for Kids' Cancer (cookiesforkidscancer.org), a national non-profit that inspires people to host bake sales of all sizes, from desktops and porches to entire corporations and communities, with some raising more than $30,000 in one day. Cookies for Kids' Cancer went on to partner with The Glad Products Company, inspiring thousands of individuals with Glad's promise to match funds raised at bake sales. The partnership has received attention from Martha Stewart, CNN, Parade, Redbook, Ladies Home Journal, Woman's Day, O The Oprah Magazine, the Today show, and more. With experience, passion, heart, and great stories from bake sale hosts, this cookbook was created to inspire more bake sales as well as directly benefit this amazing charity. 100% of the author's proceeds and royalties will be donated to Cookies for Kids' Cancer for pediatric cancer research. The recipes include easy-to-prepare treats for cookies, brownies, bars, cupcakes, quick breads, and more. 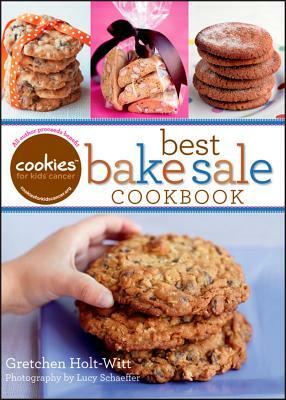 In addition, there are tips on starting your own bake sale and inspirational quotes and stories throughout the book. Gretchen Holt-Witt held her first cookie sale in 2007 after her two-year-old son, Liam, was diagnosed with pediatric cancer. To get involved in the cause or learn more, visit www.CookiesForKidsCancer.org.